I am a big fan of astronomy – not the horoscope oriented one – but the actual universe science, Edward Bess nailed it when he called these palettes Sun and Stars, Cosmic Bliss and Over the Moon… these palettes suddenly became very tempting. I knew I could use these palettes on a daily basis and with Edward Bess quality on top of that I am pretty sure it’s going to be interesting. Sun & Stars brings together four shades, ranging from cool to warm building from a peachy neutral, a warm bronze through to a slate and gunmetal grey – with varying textures from matte to pearl. Ideal to take you through from day to night and as a compliment to all skin tones. At first I wasn’t very tempted by this palette, I already have many matte peachy neutral and I don’t like bronze shades on me. The bronze shade does not apply as shimmery as it looks here and from being the one that I feared the most, it’s now the one shade that I prefer from the 3 palettes. 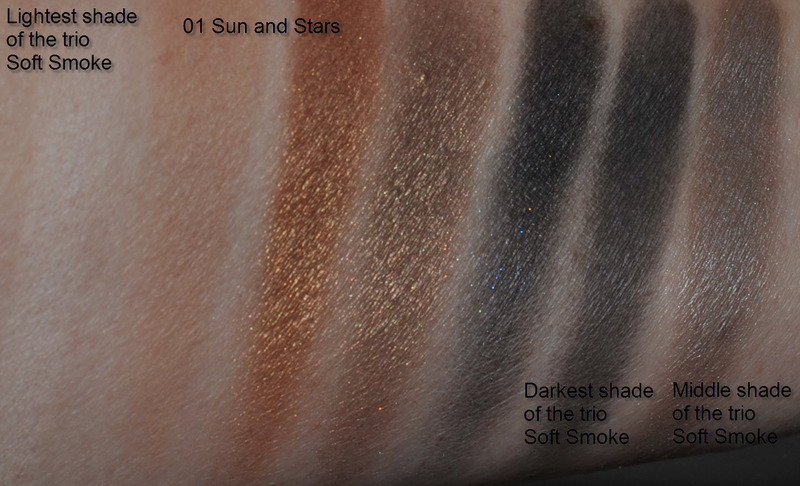 Since I have the Soft Smoke trio, I have swatched the shades together with this palette, you can see that the finish is less shimmery and the colors really differ. Cosmic Bliss brings together four warm shades building from neutral through khaki to chocolate brown – with varying textures from matte to pearl. Ideal as an everyday compliment to all skin tones. Don’t be afraid by how shimmery they look here, the shimmer is not that obvious on the lids. 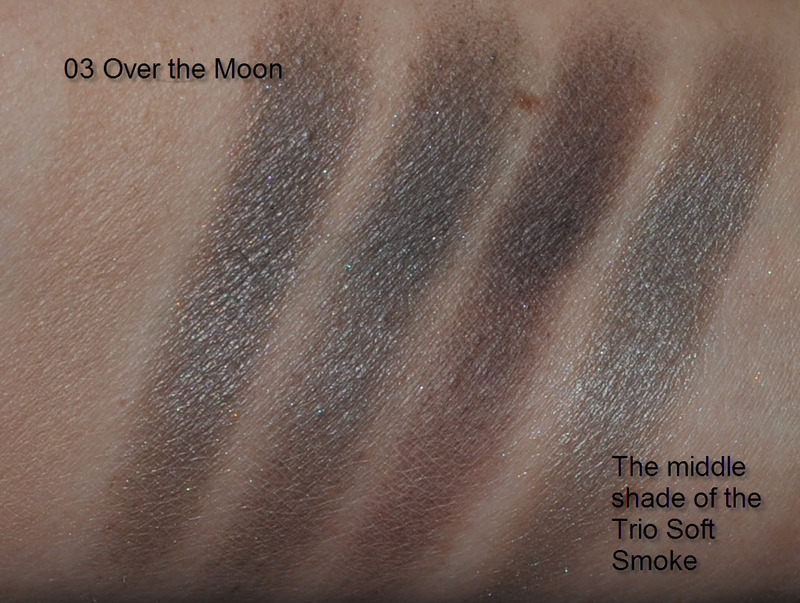 Over the Moon brings together four cool shades ranging from neutral through to blue greys that vary in their intensity – with varying textures from matte to pearl. Ideal to take you through from day to night and as a compliment to all skin tones. Just gorgeous. I like the mauvy-taupe (second swatch), the others are not very unique but on the other hand they are very wearable. Instead of putting all the same (or almost) base colors on each palette, I’d rather preferred that he put a more luminous highlight or bright shade, for example in the Over the Moon palette is where I feel the most that something has been “forgotten”. Just my opinion here… and my own personal preference. I prefer the packaging of the new quad, the reason is that it feels more solid and it’s more easy to open. You get 4.5g of product in the old trio and 7g in the new quads. The trios have little holes at the back of the palette that allow you to pop the eyeshadows out, I tried to just pop them out and it’s very well glued, I guess you have to heat the bottom of the pans otherwise it might be difficult. 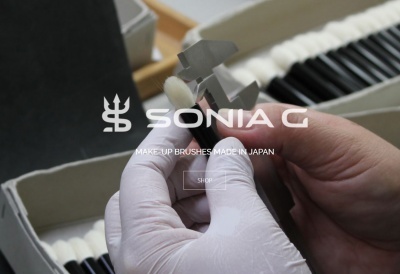 The pigmentation of both the old and the new palettes is good and both are very appropriate for ageing eyelids. I am happy to have them but I sure did not need the three of them ! 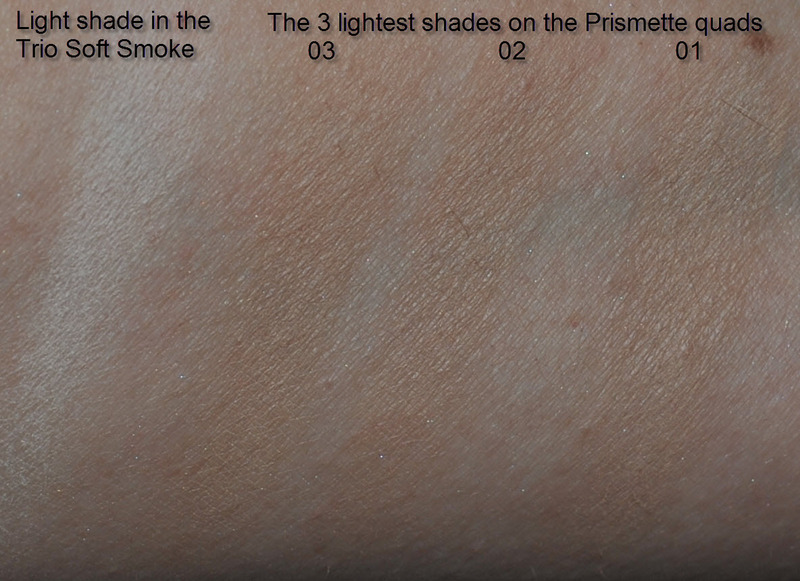 Sorry about the swatches that are not fantastic, they will improve soon hopefully ! I have been playing with Cosmic Bliss this morning, I applied the second shadow from the left on the lid and the darkest on the outer V and on the lash line. 1) it’s a bit too neutral for me, actually my hair is the same color than Cosmic Bliss at the moment 😀 (either due to me not being able to tell them exactly what color I was aiming for or due to the hairdresser’s creativity skills…) anyway, this palette, together with my hair color is just making all my features disappear… there isn’t a real “enhancement” of my eyes, they just become too blended into the whole look. Although the darkest color looks darker when applied than in the pan (which I prefer that way), if I use it together with the one just besides it, my eyes will lack dimension. Best combination for me is the second shadow on the lid and the darkest shadow as a liner and in the outer v, using the matte to blend the browbone area. 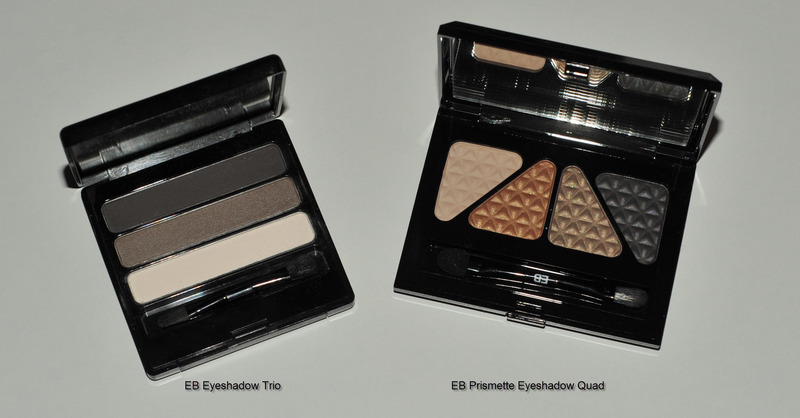 Edward Bess Prismette Eyeshadow Quads – First impressions was last modified: August 18th, 2013 by Sonia G.
I prefer old packaging too, it seems more high end, I love minimalist design. the second one make me think about rimmel or some japanese quads. The second one is really luminous. I will check out the second palette (Cosmic Bliss) tomorrow in daylight and since I am home for three days in a row I will have the chance to play with all of them. The flash makes them appear really shimmery but they aren’t that shimmery on real life. 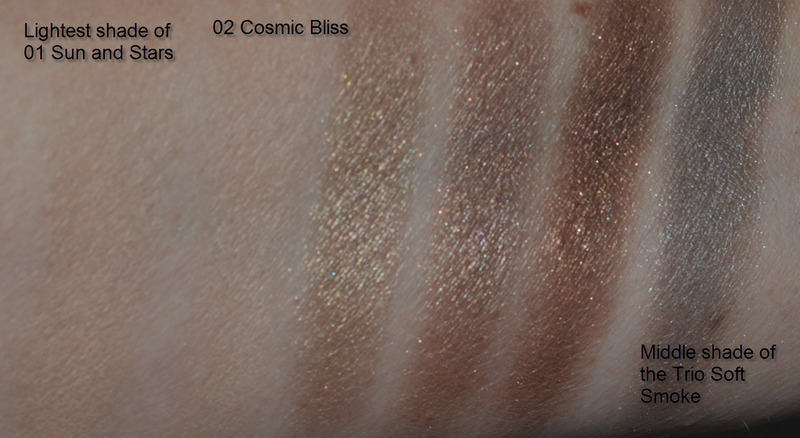 I like Cosmic Bliss a lot but Over the Moon is a disappointment as I don’t really feel that the shades harmonise well. I find the combination too dark and flat & think that it would def have profited from a more luminous/ satin highlight shade and, as you have already commented, more luminosity in general actually. I didn’t get the Sun & Stars. I much prefer the new Burberry Palettes to be honest. Even though there was some not very positive FB on them I decided to get the Plum Pink & Pink Taupe and am very happy with both. If anyone ( you Sonia?? ) has any of the other palettes I’d love to hear your experience with / feelings about them. Thank you Buggsiebee for your comment here, I really appreciate it ! that’s exactly the word I was looking for : “flat”. Good neutral looks achieved but for my taste, too flat, so I need to mix the colors either with lightest colors or with darkest ones. I am not looking for a strong eye look when I do that, I am just looking for more dimension which is something I need, to make my eyes stand out a bit more. So, great palettes, beautiful shades but I will pair them with other more contrasted colors to get the most out of them. I haven’t tried the Burberry palettes… I thought the reviews weren’t very good and I decided to go for two single shadows instead (Chestnut and Antique Rose). The plum looked nice at the counter but I just haven’t taken the time to play with them. Oh, I’m sorry you are disappointed with Over the Moon, as I’m so happy with it! I find it to be the perfect neutral for me (browns just don’t look good on me, and the TF Silvered Topaz is as brown as I can go), greyish purplish, and love that it’s dark even when applied lightly, and never über dark even when applied heavily (but then I guess this is the point where I need to explain that I have a bit of a Goth streak, when it comes to makeup :D!). Is this the palette I will reach for for a big impact look? Maybe not. But I love it for a quick and easy, dark but not over the top, neutral and work appropriate look. I have also been playing with various brushes for application, and I’ve found that the Hakuhodo Kokutan eyeshadow brush M is my favorite. Something in the short squirrel hair (not fluffy at all) that just works with those shadows. I’m glad as I hadn’t really found a use for that brush, lol. The only shade of the quad I don’t really care for or understand, is the lightest beige shade. It just doesn’t do anything for me, and serves no purpose, and I would much have preferred some kind of highlighter or a dark matte eyeliner, but oh well, I can live with it ;). 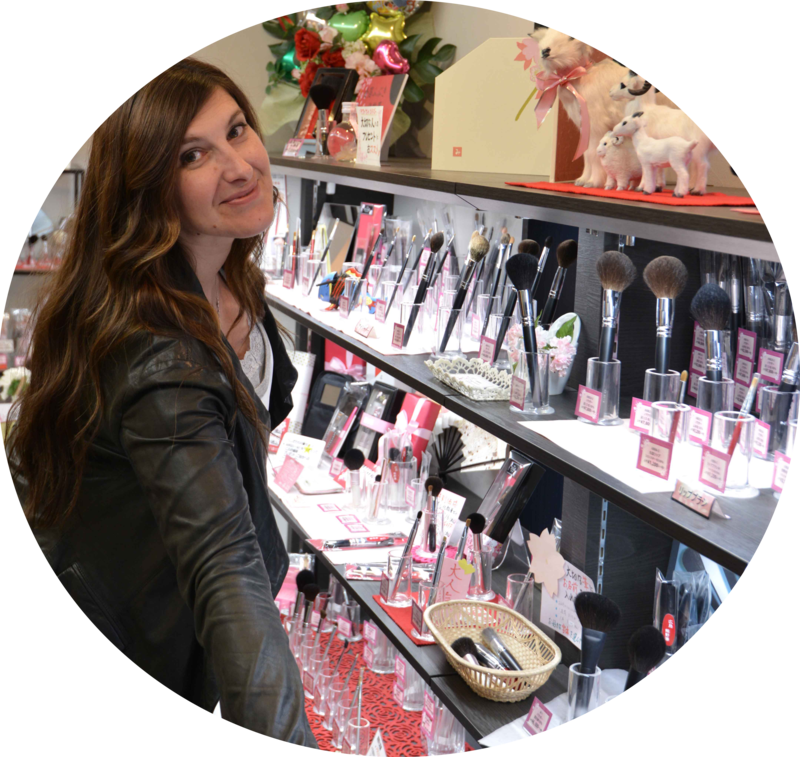 Sonia, would you say that I need the Soft Smoke Trio from EB? ?